Inspired by the strong pace and drop down to seven furlongs from a mile, Burnt Sugar rewarded his backers when getting on top in the last 100 yards. The field was spread right across the July Course, with Mukalal the overall leader in the near side. However, those towards the centre and far side dominated the closing stages in a wide-open race. Paul Hanagan drove the Roger Fell-trained Burnt Sugar through the pack to score by half a length from Spanish City and Shady McCoy, who dead-heated for second place. Cardsharp was half a length away in fourth. Tim Palin, of owners Middleham Park Racing, said: “All we do is put the horses in the races we think are right for them. 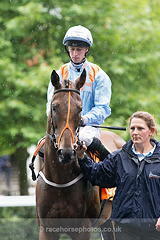 He won a big handicap over seven at Leopardstown and arguably his best form for Richard Hannon was over seven furlongs. “He was cantering all over them in the Royal Hunt Cup and he didn’t quite get home. We didn’t know whether to go for the Wokingham or the Royal Hunt Cup, as neither are his trip. Seven furlongs is his trip and he was back down to 99 when once upon a time he was rated 112. “I see the betting public got behind it and if they agree with us it just confirms we are doing the right thing. We are delighted to win the race for Roger Fell and I would say that is arguably his biggest winner. On future plans, Palin said: “I’d say that the Gigaset at Ascot is the obvious thing to go for, he is getting back to being Group-race class but we will stick to handicaps. Hanagan said: “I think the pace helped. He likes to come off a nice pace. He showed a good attitude and knuckled down well. “He won a big handicap at Leopardstown (in September last year) and they take some winning. Obviously he is a decent horse. The Bunbury Cup is named in honour of Sir Charles Bunbury (1740–1821), who served as the Senior Steward of the Jockey Club. He introduced both of the Classics held at Newmarket, the 1,000 Guineas and the 2,000 Guineas. The Bunbury Cup is contested on the final day of Newmarket's three-day July Festival meeting.